Uh - anybody want to buy a bunch of bryopsis covered LR? I then purchased a lettuce nudi who now inhabits my refugium and keeps the bryopsis controlled. I originally had him in the main tank - but man, those things LOVE powerheads. Help what started as a beautiful blue-green fernlike macro algae is now full blown out of control. 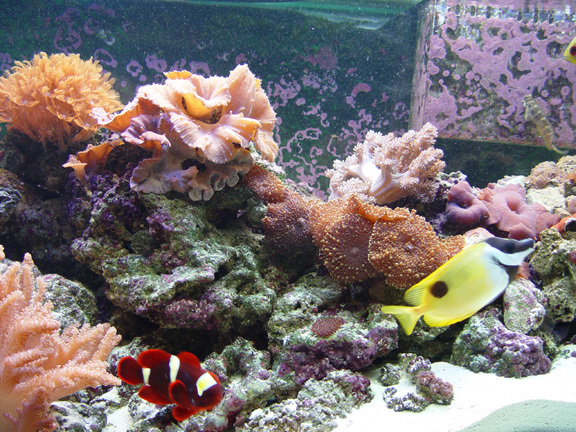 I have emerald crabs, scarlet and blue hermits, a purple tang, a sailfin blenny, flame and coral beauty angels. Nothing will eat this stuff. I have tried scrubbing the rock to no avail. I am using lots a phosphate remover in my canister and I am using UV sterilization. I am losing!! This algae adheres to everything including glass and has infected my fiji moonstone coral. I feel I may lose my tank. I noticed you are running a wet/dry with bioballs. Your Nitrate levels are probably high contributing to the problem. I would suggest you SLOWLY get rid of your bioballs and rely on skimmer and LR only to filter your tank. Also, if you can start a refugium with DSB and macro algae to reduce nutrients your problem algae are relying on. Looks like you are in a real bind. Have you seen this thread? Note: If you take the advise of the thread AZNO3 did not work for me when I was running my wet/dry with bioballs. It only started working when bioballs were removed. Does anyone know where this voracious consumer of Bryopsis might be purchased or traded? Elysia Ornata is reported to feed soley upon Bryopsis. "Can't see the forest for the Bryopsis"
This is also a good article about bryopsis. I had it, and it just seemed to go away. I have no doubt that it will come back someday. I went to this site and used this kalkwasser/vinegar mix. I was told to just pour the whole thing into my sump before it settles. 3 days later I did it again and one week later no hair algae. I myself had no problems after I did this process and best thing is I still am algae free. Even if your on the right track, You'll get run over if you just stand there. An explosion can be defined as a loud noise, accompanied by the sudden going away of things, from a place where they use to be. Thanks It's a beautiful algae! I believe I know why so many people have so many ways to get rid of hair algae. My reef is over thirty years old and for the first few years there was no hair algae. Then I started to get it in cycles for a few weeks at a time. Eventually, the cycles became longer until now I never am without it. My point is that for some reason it would disappear on it's own without doing anything and the tank would be free of it for many months. I used to have an urchin collecting business here in New York where I would collect local purple urchins to ship to aquariums and hobbiests to control algae. The northern urchins would eat very fast in a tropical reef because they were not tropical animals. Each urchin would clean an area about an inch wide and about a foot long a night. When I had a dozen of them in the tank it looked like it was sandblasted. They would live about a year. Unfortunately my boat is away for the year and I am not collecting this year anymore. Hopefully next year I will get some. Horge...congratulations. I enjoyed your article...it helped me...and I thoroughly enjoyed your style. I hope to read many more articles by you...thanks from a gentle reader. I'm beginning to think the world is run by 'C' students! I think I'm winning! All Lettuce Nudis are not created equal. I got 2 and one is a eating machine and the other is usually on the glass. nice looking tank dc. no green algae! I have heard reports of people using boiling RO water, applied to the problem area with a syringe. I have been told that this has a two fold effect of killing the majority of the algae due to both the heat and the fresh water, and the fact that it becomes more palatable to herbivorous fish in this state. Has anyone heard of this method being successfull? At various stages, I have had my whole tank virtually full of bryopsis, and through a process of manual removal and addition of a rabbit fish, I have it down to 2 smallish patches. I have no problem at at with any other algae, my Acantharus mata takes care of everything else, but the bryopsis persists, which is why I am considering using the boiling water method. Would you remove the rock and then treat the Bryopsis or treat it in the tank? I do not think dosing the algea in the tank could produce enough heat to do any good. How about manually removing and scrubing the rock then treating the growth areas with boiling water? How about mixing some amount of bleach with the water and then soaking rock in a bucket treated with chlorine remover? My tank is about 75% inundated. I am ready to throw all my rock away and start over. I got to the point where I was going to take my entire tank apart and start again as well, but I removed the pieces of affected rock, and scrubbed them with a scrubbing brush in a bucket and replaced them, which seemed to do the trick. The only reason I dont want to take the remaining pieces out and clean them, is that they are pivotal pieces of the reef structure, and cant be taken out without taking the whole structure apart. get an algae / lawnmower blenny... mine is obese. I'm not kidding. I think I am abusing the poor fish; he has a huuuuge gut. You cant type this and not show us pics of your overweight lawnmower blenny!!! Last edited by Gerard the fish; 01/02/2004 at 09:30 PM. Visit Gerard the fish's homepage! This came on a rock that I got at my LFS that had lots of zo's on it. Since then it has spread like crazy. You will also need a picture showing the rock up close. "just cleaned thirty year old tank" in the reef section. I bought two algae blennys and they d'ont seem to be picking on the stuff only the algae on the glass so i what i did is took some of my rock that had been covered with Bryopsis and frist scrubed it off with a hard brush and then i mixed up a batch of kalkwasser and brushed it all over the infected area i soaked it real good then i dunked it in old or fresh sea water and back in to the tank so far the spots that i treated no sign of Bryopsis its been four days now the only draw back to this plan is i have some rocks that are on the the bottom and to remove them would mean to take the whole tank apart so for those i am still looking for help if there is any i would gladly wellcome some.